Seidlitz Family Blog: Even Google knows! Well, I finally passed the big mid-life milestone. Today is my 50th birthday. 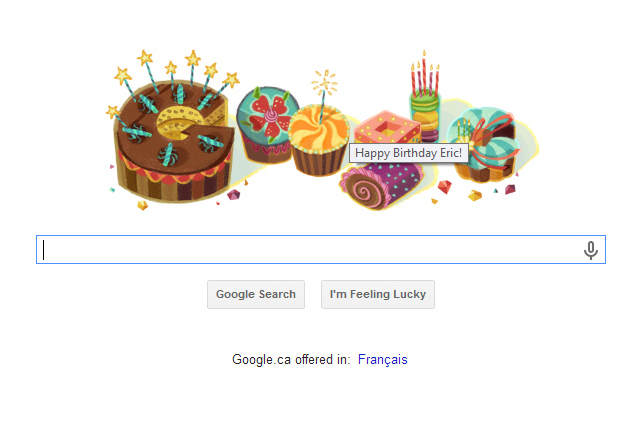 Seemed like a pretty quiet day, but even Google knew my secret. Most everyone at the lab is away in San Diego for a conference, so it was a reasonably calm morning. The big event for the day was to be the final class for the course I teach at McMaster. It was planned as a debriefing session and a pizza party, plus some unnamed special significance (as per Professor Rangachari - Chari for short)... a little worrisome. Wendy even decided to drop by the class to see what was up. Yeah, I fell for that, too. Soon after leaving my office with Chari, we came upon a 'gauntlet' of students lining the halls and the stairways. They all were holding up signs or pictures of my face plastered on cardboard. Each one of them gave me a different compliment (nice shoes, great glasses, I like the way your glasses sit on your ears, etc.). This is when I truly knew that something was up. This compliment gauntlet went on all the way to the lecture theatre, and at some point during this walk Chari ditched me and headed into the room from a different direction. Once I entered, there was Wendy at the top of the room and about a half dozen students. The students made a big show (many are actors...) about their wonderment at where the rest of the class might be. Well, in short order all 200+ students piled into the room and started a raucous rendition of Happy Birthday! This was followed quickly by a number of chants and other fun stuff typical of the first year Health Sciences class This was definitely the loudest birthday greeting I have ever had!! The students got together and bought me a cake to take home - they suggested there would be nothing left if all 200 of them took a piece. After our debriefing session, the pizza and salad arrived and the whole thing devolved into a year end pizza party with lots of chances for informal discussions of how the course went for the students. Even a few selfies were taken. What a great way to turn 50! I had a wonderful time and got to see how this group of scared just out of high school kids in September have grown into such bright, confident, and engaging young men and women.